Work on the Warwick Valley Central School District’s Solar Power Project is nearing completion and is expected to begin generating electricity by early 2018. A worker installs solar panels. 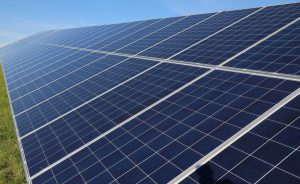 Once finished, the solar project, located on the campus of Sanfordville Elementary School, will be the largest school district-owned solar project in New York. The 2.419 megawatt solar powered array will generate approximately 2.9 million kilowatt hours of electricity each year, enough to likely offset the District’s entire electricity bill through monetary credits. The Solar Power Project is expected to begin producing electricity by the end of the year. Work on the 10-acre solar project began in July 2017 and the construction phase is on track for completion by Nov. 30. While the project has encountered some difficulties – the soil is quite rocky, which complicated the installation of several panels – the project remains on schedule. The project cost is approximately $5.7 million. The District will borrow the money and make payments for 15 years, but, said Timothy Holmes, the District’s Superintendent for Business, 53.8 percent will be returned to the district annually over those 15 years through New York State Building Aid. An aerial view of the 10-acre Solar Power Project. Currently, the District spends about $500,000 each year on electricity. 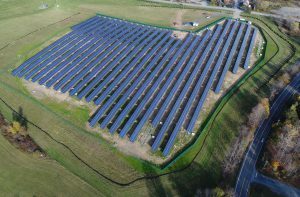 Power generated by the Warwick Valley Solar Power Project will feed into Orange & Rockland’s power grid and, in exchange, the District will receive a per/megawatt monetary credit. This credit will cover most, and in some years all, of the District’s annual power costs. 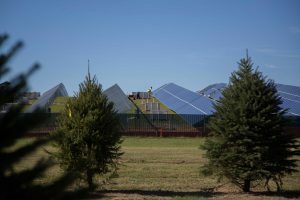 The solar project is part of an Energy Performance Contract (EPC), approved and aided by New York State. It also qualifies for incentives through the state’s Energy Research and Development Authority, and will have no tax impact or implications on local taxpayers. The project will pay for itself in savings in 12.82 years. For the safety of students, and the protection of the solar panels, the project includes security cameras and fencing. Also, trees have been planted along Sanfordville Road to provide a visual barrier. The solar project is among several green initiatives in the District. Other environmental efforts include the purchase of propane-powered school buses, LED lighting, a food waste disposal system, a rain garden at the High School, green education programs for students, and a District sustainability policy.